German beers aren't generally my forté, but heck.. I'll try them! The majority of German beers here are either discount beers in tall cans, or else general wheat ales of different styles. 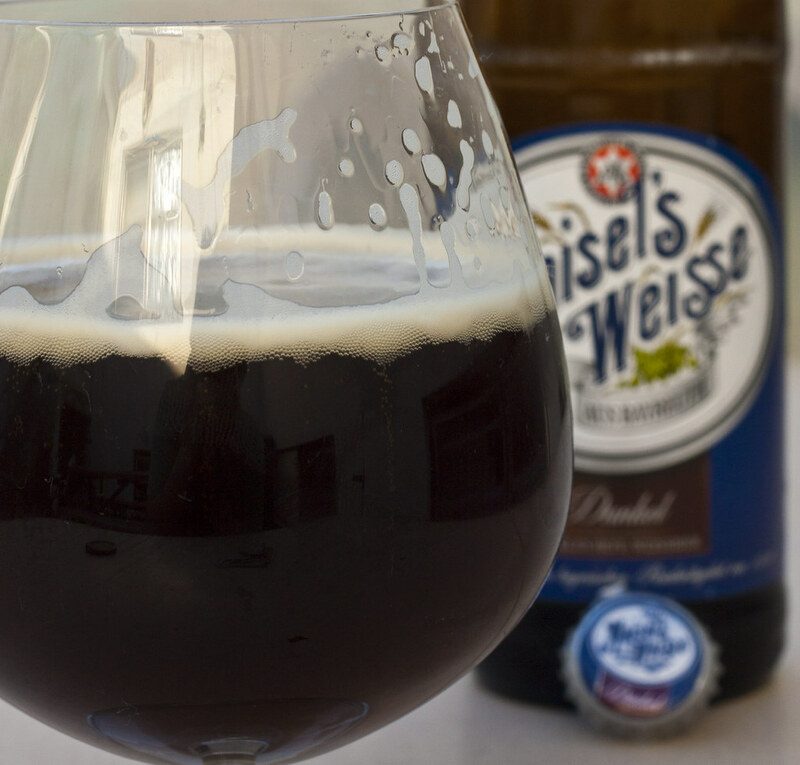 Maisel's Weisse Dunkel (Brauerei Gebrüder) is new to Manitoba - so new in fact that the Liquormart announced it in their Sip & Savour newsletter just yesterday! Dunkel is a style I'm not familiar with - the only other dunkel I ever tried was Big Rock's Dunkelweizen earlier this year. Appearance: While pouring the beer into the glass, it shows up as caramelly brown, but as soon as it settles into the glass, it's much more of a dark brown, similar to a Unibroue Trois Pistoles, I suppose. Decent amount of creamy pale yellow cream head. Aroma: Quite sweet, in fact - I was wondering what beer this reminded me of, turned out it was Big Rock's Dunkelweizen! It has quite a sweet "grape" aroma, almost perfume-like, fruity. Also a great amount of banana in it, like a hefeweizen - the more I pay attention to this, the more it smells like banana rather than grape. Slightly bready and somewhat floral. Taste: Somewhat sweet, a bit of a raisin in it, but banana is the overall taste in this beer. Somewhat creamy to the mouthfeel, and not much of an aftertaste lingers, except a slight metallic and banana taste. Overall Thoughts: Actually, this isn't bad at all! At $3.55 for a 500mL bottle, it's a great summertime treat. The appearance of this beer is nothing compared to the aroma and taste. Taste wise, it reminds me of a hefeweizen (as this is a wheat ale after all) thanks to the banana and grape notes. The appearance is more of a dark ale, reminiscent to a Trois Pistoles. Very much satisfying on a hot summer day. Not overpowering in any way, but it's not really missing anything either. It has an ABV of 5.2%, much lower than you would expect just by looking at this beer, but hey.. sometimes we want something a bit lighter!